Sougo and Hiryu battle. They deliver finishers at each other and Sougo is forced to dehenshin while Hiryu disappears. Watching from the sidelines, ShiroWoz tells Geiz he is disappointed that his heart doesn’t seem to be in it. The Geiz Revive Watch not activating shows that. ShiroWoz tells him to regain his focus or he’ll disappoint Tsukuyomi as well. Sougo has another dream of him battling Geiz on Oma Day. He wakes up to KuroWoz standing above him. He points out what a big dilemma Sougo is in at the moment. The TimeJackers watch as Tsukuyomi lifts off for 2009. Away from Schwartz, Heure asks Ora what the hell is going on. Why is Schwartz pushing Hiryu to become the next king? Ora tells him to stop worrying as this is very much unlike him. Heure just says he’s worried Schwartz is plotting behind their backs. Back at the shop, Uncle Junichiro tells Sougo about Tsukuyomi visiting earlier to ask about Hiryu. KuroWoz asks who Hiryu is, but Sougo still doesn’t remember even though he seems familiar. KuroWoz reminds Sougo that Hiryu is collecting Rider Power. Sougo remembers Hayase is still in trouble so he hurries out. 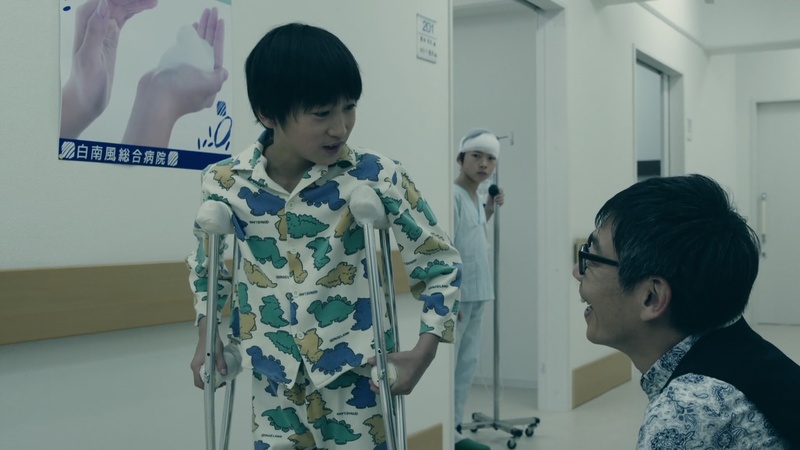 In 2009, Tsukuyomi is at Shirahae General Hospital hoping to visit Sougo’s room after the accident. She waits at the front desk to find out which room, but just then, Sougo and Uncle Junichiro walk by. Uncle Junichiro says Sougo can come live with him once he’s discharged. Sougo happily thanks his uncle and they go get some ice cream. A young boy, which turns out to be Hiryu, watched the scene from the doorway of his room. The nurse urges him to return to bed until he is fully healed. Hiryu asks the nurse about Sougo. He then angrily shouts that the accident was Sougo’s fault. He knocks his IV over and jumps under the covers. Tsukuyomi calls Geiz to tell him about what she saw, including Uncle Junichiro coming for Sougo, but no one coming for Hiryu. Otherwise, she doesn’t have anything else. Geiz, meanwhile, informs Tsukuyomi that Hiryu is Another Zi-O. He says he might be able to defeat him with Geiz Revive, but was unable to use it. Tsukuyomi stops in her tracks, but says she understands. She’ll travel back to the day of the accident to find out more. 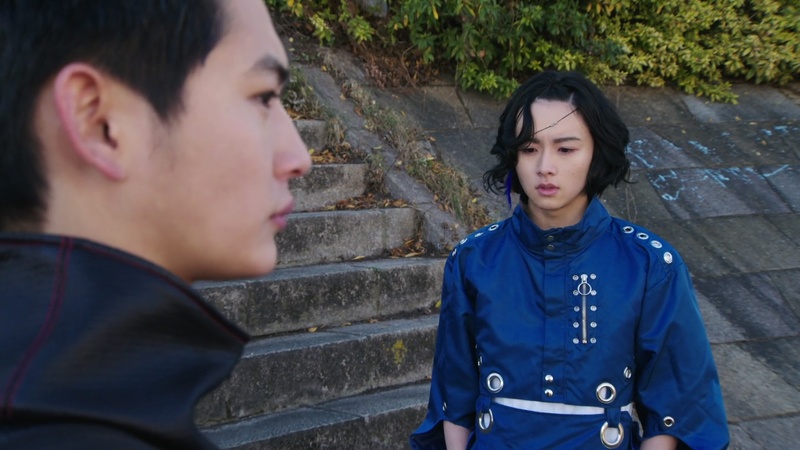 Geiz ponders life by the creek when Heure pops up and asks where Tsukuyomi popped off to. 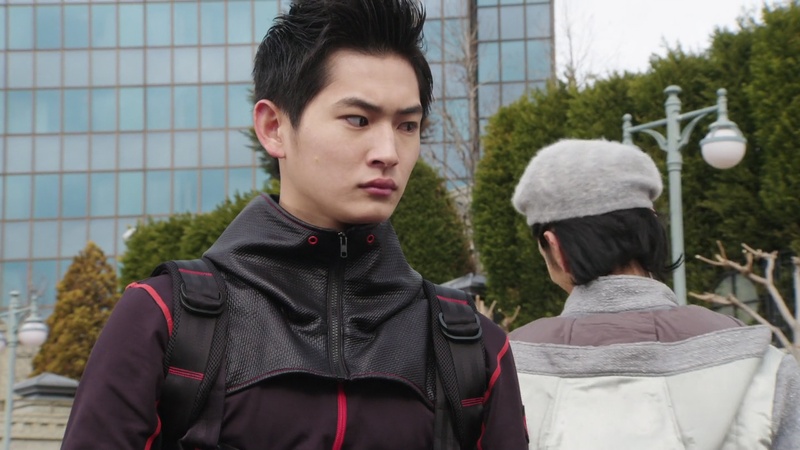 Geiz asks what Heure is plotting, but Heure really isn’t in a position to be plotting anything at the moment. Heure points out Oma Day is fast approaching. But he is starting to be unsure about their goal of finding a new king to change the future, especially with all the wildcards that have popped up recently. Heure again asks where Tsukuyomi went and why. Geiz refuses to answer. Heure says he just wants to know what happened in the past and how it connects to the future. Sougo leans Hayase quit the magic café and realizes he must have headed back to the old magic house. He suddenly flashes back to him becoming Another Wizard. Hiryu appears and he is able to take Hayase’s remaining Wizard power. Sougo arrives and finds the unconscious Hayase. Hiryu says he’s taken the power. Sougo wants to know why Hiryu is targeting him. Hiryu decides to tell him the reason he’s going to kill him: Sougo is the reason his family died. Hiryu says he was so close to Sougo back then. And on the bus, Hiryu heard Sougo’s name being called out by a mysterious woman in white pointing and shooting a blaster his way. Hiryu remembers Sougo telling him about people from the future coming to try and stop him from becoming a demon king. And because of that, Hiryu lost his family. They both henshin and battle. Geiz, meanwhile, travels back to April 24, 2009, the day of the accident. He wonders if it wasn’t an accident at all. 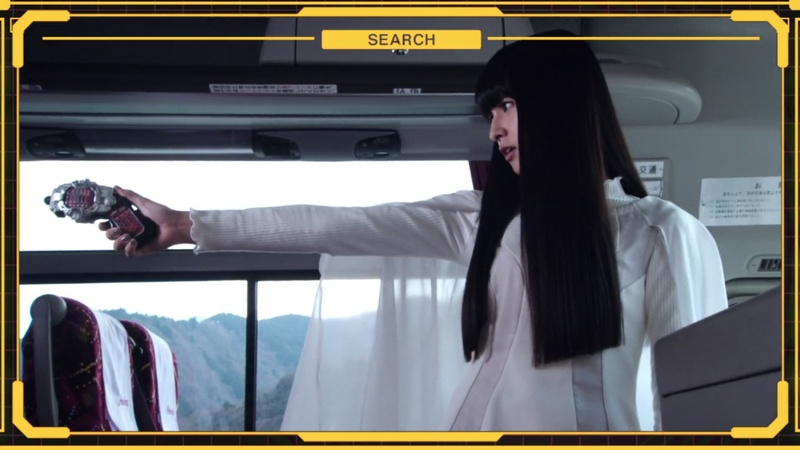 Geiz scans the bus and is able to see the moment Tsukuyomi shoots, calling out Sougo’s name. Seconds later the bus is on fire and proceeds to crash and explode inside a tunnel. 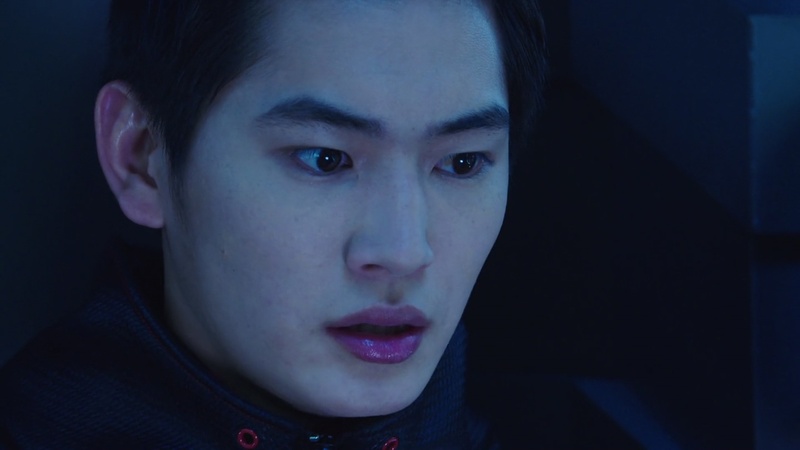 Geiz is shocked and speechless. But he realizes what he must do. He returns back to 2019 and leaps right into the middle of the battle between Sougo and Hiryu. He punches Hiryu with his bare fist. Hiryu tells Geiz to not interfere as he will be the one to defeat Zi-O. But Geiz says defeating Zi-O is his mission. Geiz locks in his Watch with one hand. His bloody hand activates the Geiz Revive Watch and locks it in. Geiz henshins to Geiz Revive Goretsu. ShiroWoz gleefully makes the proclamation. Hiryu tries taking Geiz on, but Geiz Revive is too powerful. Before Geiz can deliver a decisive blow, Schwartz freezes time to whisk Hiryu to safety. Schwartz says they will all meet again on Oma Day. 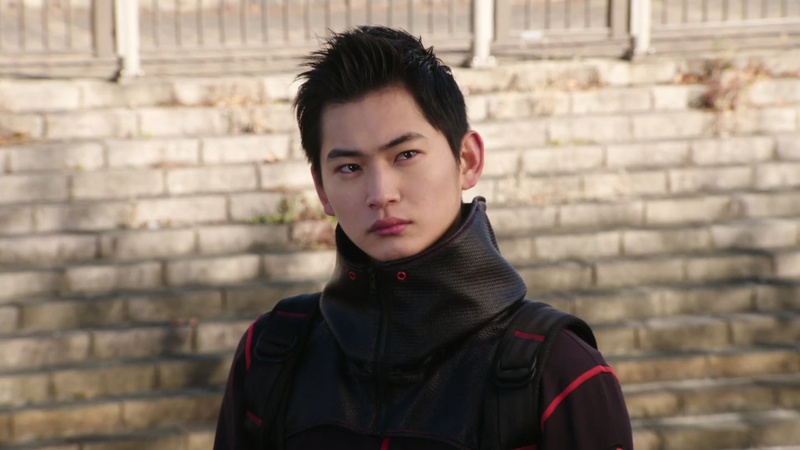 With Hiryu gone, Geiz turns his attention back to Sougo. He says their future involves Geiz defeating Sougo. In that case, they battle. Sougo uses Zi-O II’s future-seeing power. But he is taken by surprise when Geiz is able to counter with Revive Shippu which allows him to jump seconds later into the future instead. 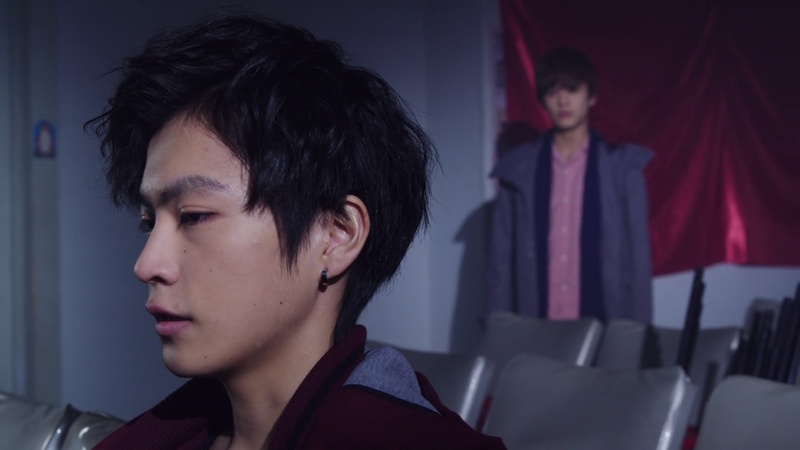 Geiz has Sougo pinned to the wall and henshins back to Revive Goretsu. On the other side of town, KuroWoz has just put the entire bus terminal to sleep so he can snoop around into the bus manifest of the day of the accident. He sees Sougo and Hiryu were on the same bus. But he is shocked to see that also on the bus was a man by name Kadoya Tsukasa! Oooo! Lots of plot in this episode! How to digest it all. First of all, I’d like to say that piano version of “Over Quartzer” was beautiful. For as much as the theme song can get you up and dancing, this piano version played during Geiz and Tsukuyomi’s phone call was so emotional and sad. Almost got me to tear up a little bit. 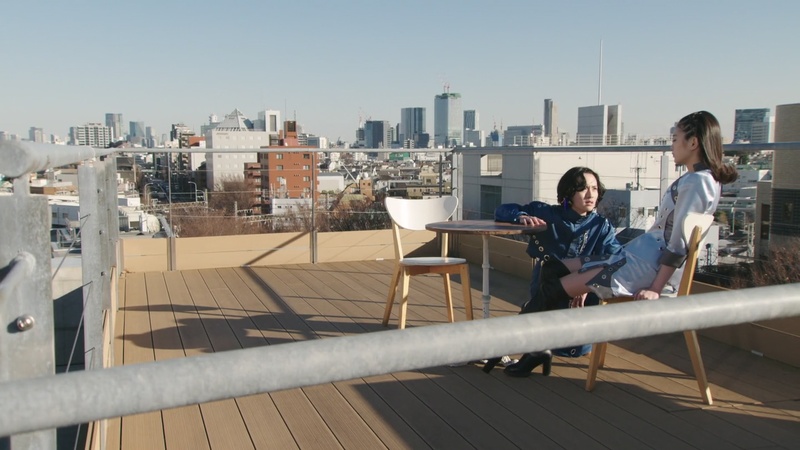 But I think it also helped set the mood of that scene and really helped to illustrate how both Geiz and Tsukuyomi seem to be at a loss for what they can do now. It very much feels like they’re trying to fight back against their desperation. The dilemma of having to save the world’s future, but also knowing that they’ll have to be killing someone who’s become their friend. We know Geiz has been struggling with that the last few weeks. And Tsukuyomi has very much seen that. What could Tsukuyomi be doing on that bus in 2009 pointing a blaster at a little boy? It was of course a shocking moment when Hiryu mentioned that woman in white. We all knew it was Tsukuyomi. And that moment of trying to think about how she could be involved on the day of the accident, let alone maybe being the cause of it. But after Hiryu’s flashback, I go back to Geiz and Tsukuyomi’s conversation. And I realize, Tsukuyomi might have very well taken a desperate action? Maybe not necessarily something as extreme as killing young Sougo. But perhaps doing something she had warned against earlier: changing history. 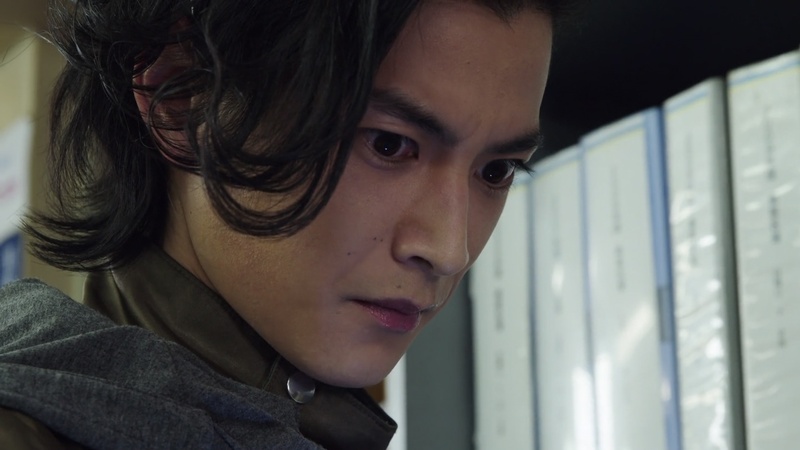 Geiz seeing Tsukuyomi on that bus and seemingly pulling the trigger then pushes him to make the decision and gather the resolve to finally be able to use Geiz Revive. Again, maybe not with the full intent on really killing Sougo now. But taking that chance and hoping by using the power, he’ll be able to find a way to save Sougo (and maybe also save Tsukuyomi from doing something rash). Whew. Trying to piece together how it all works out gets us dangerously back into trying to figure out the butterfly effect and the endless cause and effect of the time traveling and changing history! And I definitely don’t want to have to do that. Lol So, we’ll just have to wait and see. But what’s for sure is there’s definitely the groundwork for some great drama and moments coming up if they can maximize that potential. Elsewhere in the episode, I like Hiryu’s character and the way they’ve introduced him. It appears he isn’t just a two-episode arc character, so that gives me hope there’s a much deeper story waiting for him and his relationship with Sougo. I definitely hope there is. I really liked seeing that moment between young Sougo and Uncle Junichiro as well. The quick look at Heure also seeming to be in a personal crisis was great too and I hope the dynamics of Heure, Ora and Schwartz continue to be explored in interesting ways. The Geiz Revive powers and him just swatting Hiryu and Sougo back like that was very exciting! Different and refreshing style of explosions and action than we normally see. And Geiz punching Hiryu with his bare fist was badass! Overall, another really great and enjoyable episode for me. The season continues to build up the excitement (and my expectations! ), so I might be setting myself up for a big disappointment. But I like to stay hopeful of course. Hehe. How Hiryu can be so rude for Sougo for something that Sougo had no effect? He hasn’t treat him like that. Next time, Tsukasa Kadoya is back. What is he planning this time? 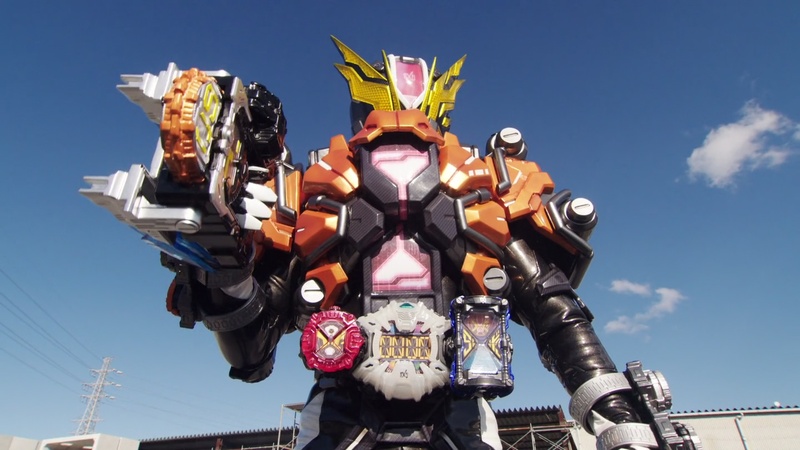 And Black Woz become Kamen Rider! Damn, Tsukuyomi really jumped off the cliff now. 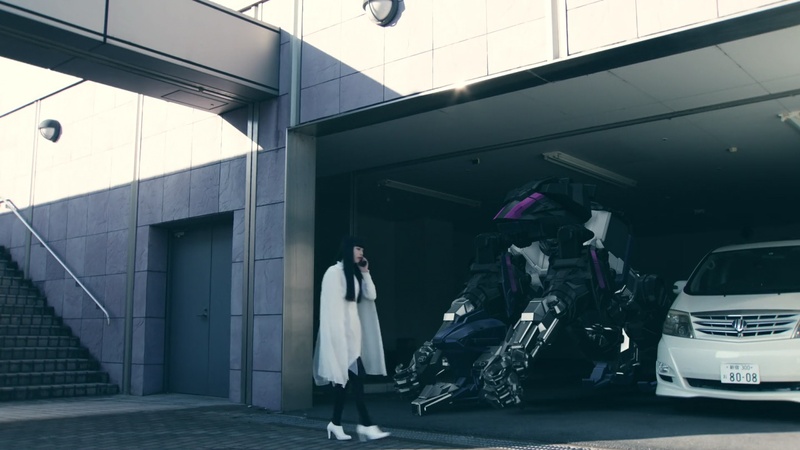 Considering that she was pretty much the one preventing Oma Zi-O vs. Geiz Revive from happening, these last few events has really not been kind to her. Okay, so we pretty much know that Tsukuyomi will survive her apparent death here, but the question here is how? She doesn’t have time manipulation powers of her own. I’m speculating a bit, but it looks like they are setting up some sort of redemption arc for her with these last few episodes. Who knows, that Kamen Rider Tsukuyomi joke in the supplementary plans might not have been a joke after all. ooo! That would be interesting. Didn’t think of that. Well, now we know why Hiryuu hates Sougo. It’s also ironic that the reason he blames him is beacuse of the actions of Tsukuyomi. And just what is Schwaz up to in the past? Yeah, there’s definitely a lot of questions about that “incident” in 2009!